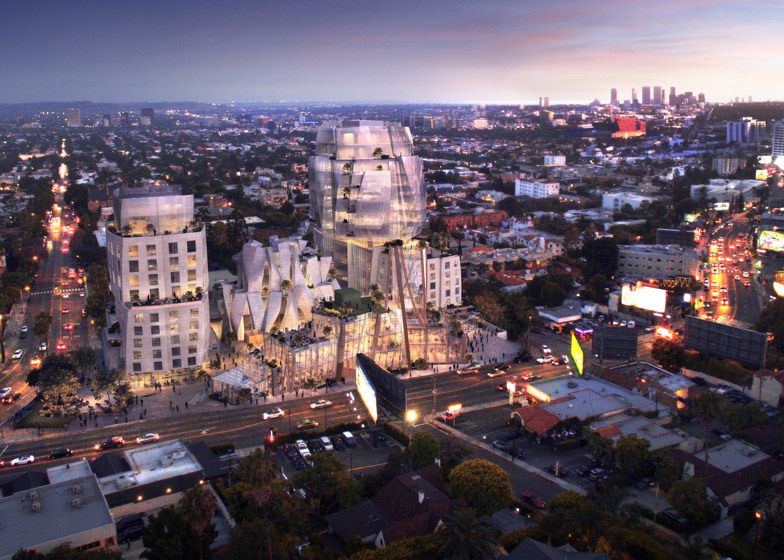 Architect Frank Gehry has conceived five distinct but interrelated buildings for a prominent site along LA's famous Sunset Strip. Unveiled Wednesday, the design for 8150 Sunset Boulevard features five buildings that are united by a common plaza at street level. Public space is interwoven into the complex, which will encompass 334,000 square feet (31,000 square metres). The site anchors the eastern end of the Sunset Strip and faces Hollywood Hills to the north. The development will have low heights along the street in order to relate in scale to nearby buildings. The area features architectural and cultural landmarks such as Chateau Marmot, a storied hotel meant to evoke a French estate, and the Art Deco-style Sunset Tower. Gehry – who was announced as the architect in March – will design all of the buildings, interiors and landscaping. The Pritzker Prize-winning architect said his design was loosely inspired by the Garden of Allah, a legendary mansion-turned-hotel on the Sunset Strip that was built in 1913. Humphrey Bogart, Greta Garbo and F Scott Fitzgerald were among the many celebrities who stayed there. Set on a three-acre (1.2 hectare) estate, the Spanish Colonial Revival-style hotel was surrounded by tropical plants and fruit trees. But it was demolished in 1959 to make way for a bank building. "By coincidence, I was in LA when the Garden of Allah existed, and while I don't have a tangible image to relate to the present, I have a feeling that this design leans toward the representation of my memory," said the 86-year-old architect of his concept for 8150 Sunset Boulevard. "I wanted to capture the feeling of the experience of that place which was vibrant and memorable," he added. "It has always been important to me to be a good neighbour to the surrounding buildings, and I think we have created an ensemble that responds to the great diversity of the neighbourhood and is an asset to the community." The development features two residential mid-rise structures that are both sculptural in form. The eastern, 11-storey residential building gestures toward Sunset Boulevard and the intersecting Crescent Heights Boulevard, while the the 15-storey building on the west is scaled to relate to Chateau Marmont. The residential buildings will contain a total of 249 units – a mix of rental apartments and condos – and the additional structures will house retail and entertainment spaces. A three-storey retail building will have glulam mullions supporting a glass curtain wall, and will feature a marquee element. "This street-front building will also promote an accessible pedestrian experience and invite people into the site's interior plaza," said to developer Townscape Partners. The open-air plaza, featuring hard and soft landscaping, can be used for special events. At the centre of the plaza, Gehry's proposes a building with a facade made of stone cylinders and cones. An original masterplan for the site, by San Francisco-based Hart Howerton, was unveiled in 2013. Gehry's design will be submitted for an environmental impact review in September, one of several steps in the approval process. "Frank Gehry has proposed an iconic and powerful design," said Tyler Siegel, a founder of Townscape Partners. "His plan brings truly innovative architecture to an important and historic corner, where Los Angeles and West Hollywood meet." "At the same time, Gehry's plan for the site provides welcoming and accessible pedestrian areas that will encourage people in the community to gather and visit, as well as much needed additional housing options in the neighbourhood." Gehry is keeping busy in LA, where he has lived since 1947. He recently was commissioned to design a revitalisation plan for the LA River, a canal-like waterway that winds through the city. Other recent projects in LA include a proposed "hilltop village" by MAD and a prototype for a micro dwelling designed by UCLA's CityLab. The Broad, a contemporary art museum by Diller Scofidio + Renfro, is set to open in the city on 20 September.